In one of the last cities standing after the world fell to monsters, best friends Zed Kagari and Brock Dunderfel have high hopes for the future. Zed desperately wishes to join the ranks of the Mages Guild, where his status as Freestone's only half elf might finally be an asset. Brock, the roguishly handsome son of merchants, is confident he'll be welcomed into the ranks of the Merchants Guild. But just as it seems the boys' dreams have come true, their lives take a startling turn . . . and they find themselves members of the perilous Adventurers Guild. Led by the fearsome Alabasel Frond, the guild acts as the last line of defense against the Dangers-hungry, unnatural beasts from otherworldly planes. And when the boys uncover a conspiracy that threatens all of Freestone, Zed, Brock, and their new allies-Liza, a fierce noble, and Jett, a brave dwarf-must prove their worth once and for all. This start of a thrilling new series is sure to be a hit with readers who like their fantasies clever and action-packed, with tons of humor and heart. I would't know for sure but what I have watched about it on The Big Bang Theory I was ready for this to be a D&D meets Lord of the Rings fantasy adventure story. Am I wrong, I am not too sure but who doesn't like picturing a young Orlando Bloom as one of the main characters? Hopefully more than just me...but that is not the point. I came in wanting an adventure and I left getting so much more. 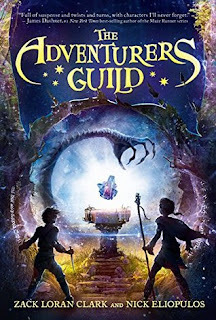 In one of the last surviving cities that have yet to fall to the Dangers the cities last defense lies on the strength of the Adventurer's Guild but what two best friends, Brock and Zed are about to find out their hopes of becoming a part of a particular guild are put on a pause when they soon find themselves part of this defense. I find it interesting in how the relationship between two friends changes over the course of time when in similar settings especially ones where your life is put on the line. Not much changes except for the fact that two more join their forces and the start of a strong friendship is soon on the horizon. This is such a perfect read for readers wanting a fast-paced fantasy adventure that shows themes of friendship, betrayal, love, and finding the strength within yourself to succeed. I wasn't sure where this book would go but I am really happy that it went the way that it did. I think we saw all the characters not only at their best but also at their worst. I think we may sometimes want to focus on character's best moments even though what happens after they fail shows a character's true ability to be likable. The way the story concludes is perfect because it leaves room for more of an opening for a much bigger story and with the world that both Zach and Nick have created I can and will expect nothing less. I enjoyed battling the dangers with all the characters and see the power of friendship flourish strongly throughout the novel in this take. Zach and Nick are a brilliant pair and have written a novel to meet the needs of fantasy lovers of all ages. I may or may not have watched some Lord of the Rings after reading this story but that is left for me to know and you to live in the never-ending questioning of what I did. Am I excited to read the next installment? Yes! Should you add this to your reading pile? Yes! The Adventurer's Guild is a novel written for those seeking an adventure full of strength, magic and adventure.